I've been a bad girl, I know. I took a few days off from blogging and missed it while I was gone, but I was able to organize my entryway which was much needed. Hopefully I'll be able to post a photo tomorrow, if the weather cooperates. It looks a million times better now, even if I do say so myself! But back to today. Since I'm all about painted furniture and itching to get started on the pieces stacking up in my garage, I'm posting some inspiration images. I love Canadian House & Home magazine, and if it wasn't $57 for a subscription, I would have it delivered to my box every month! Maybe next year I'll get over the price and get one . . . or not. You can find so many of these pieces at thrift stores, though they're not always in the best structural condition. Love the contrast /pattern in the couch, lamps, and nightstands! These were just a sampling from CHH. I recently stumbled upon the magazine while perusing in Borders and have been in love ever since. If you get a chance to check out a paper copy, please do. If you're like me, you'll love it too. Love the blue--different, but not overpowering. I can't remember where this image came from, so if anyone knows please enlighten me! Jelena from Poppyseed Creative Living is selling this great piece (and a few others, too) on Etsy. 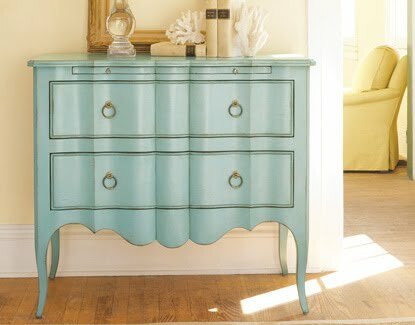 Kelly at High Street Market found this amazing dresser and refinished it to look like a one of a kind piece! I love the simple hardware that doesn't take away from the details of the dresser. Her blog is great and has some amazing images, so go check it out. I love, love, LOVE this daybed and probably would cry tears of joy if I ever found something like it. The 5 images above were all found via Design Sponge, and this one was submitted by Kate Pollman who wasn't listed with a link, but I think she may be a jewlery designer. Hot stuff. I can't wait to get back to finishing my pieces . . . .